To enjoy Life and to live each moment fully move from mind to no-mind. We have all been conditioned to believe that the human faculty to think is what differentiates us from other forms of creation. Undoubtedly it does. But the human mind is also responsible for causing all our suffering. The nature of the mind is that it keeps generating thoughts. And the other fact is that the mind thrives only in the past or in the future. But either position is irrelevant in the present moment. Which is why it serves no purpose for the mind to be in the past – which is dead, which is over – or to imagine a future – that is still unborn, yet to arrive. Life is always happening in the present moment, in the now. So, when we listen to the mind, we are missing living in the moment. We are missing the beauty and magic of Life. In Buddhism, the mind is referred to as the Monkey Mind. This is to emphasize the point that there is a constant churn of thoughts, most of them unsettling in nature, that is happening in the undisciplined mind. With a mind that is steeped in anger, grief, guilt, fear, anxiety, worry and such wasteful, debilitating thoughts, where is the opportunity to live in the moment? One Buddhist scripture quotes the Buddha even describing the mind thus: “The human mind is like a drunken monkey that has been stung by a bee.” This is so apt. So powerful a metaphor that I can totally relate to. The mind is powerless in the present. So, when you are trying to relax, for instance, watching TV or a sunset, the mind will remind you of a sunset that you watched with your girlfriend. And your thoughts will go to a time in the past that is so painful because your girlfriend and you had a messy break-up. Or it will drag you into the future, to a worry about some unpaid bills and the lack of cash to meet them – which includes not being able to pay for your DTH TV connection coming due next week! When your mind wanders, it will stop being in the present. So will you. Which is why all of us are leading incomplete lives – lost in mourning about the past or worrying incessantly about the future. This is why we suffer. Since we cannot undo what has happened nor can we tell what will happen, we are either pining for something is not there or we are fearing something which we believe will happen to us. Both these thoughts cause our agony and suffering. I have, over time and consistent practice, learnt to tame the drunken monkeys in my mind. I do this by having conversations with the monkeys. Every time a monkey starts jumping around in my mind, I talk to the monkey. For instance, whenever I think of someone who has betrayed me or has been unkind to me, Anger Monkey starts jumping up and down. I ask Anger Monkey, “What’s the point in your getting excited. It’s all over.” The Anger Monkey replies, “But you were cheated, you were pissed on and passed over. You must avenge.” I would say, “I am not interested. Why do you insist?” Anger Monkey would reply: ‘So that they (my detractors) don’t get the feeling that they got away with doing what they did to you.” I would conclude, “Let them. I am happy not wanting to prove anything to anyone or teach anyone a lesson.” That would be it. And I would go back to living my Life without the least trace of anger or vengeance in me. But, as I said, this attitude is something you cultivate with practice. This is true for every monkey in your mind – from Fear Monkey to Guilt Monkey to Worry Monkey. 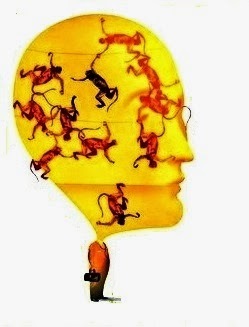 To expect thoughts – the drunken monkeys – not to arise in your mind is futile. As long as you are alive your mind will be churning out thoughts. Intelligent living is the ability to tame the drunken monkeys and make them powerless by staying in the present. This then is the state of no-mind. Try to be in this state for as long as possible each day. That’s the only way to not be held hostage by the past or be fearful of the future. That is the only way to live in the now!